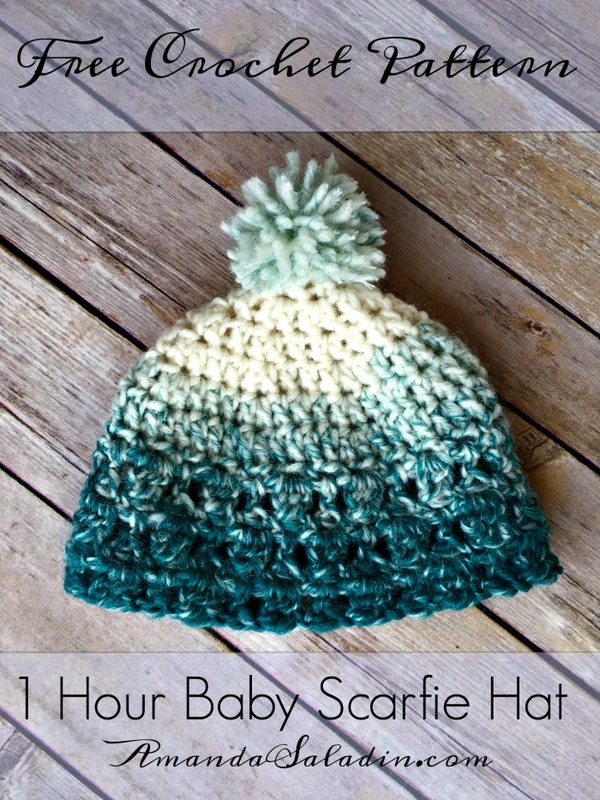 1 Hour Baby Scarfie Hat - Free Crochet Pattern - love. life. yarn. I had such fun creating all the teacher’s gifts this year using Lion Brand Scarfie yarn that I decided to make a baby scarfie hat out of my remaining yarn. 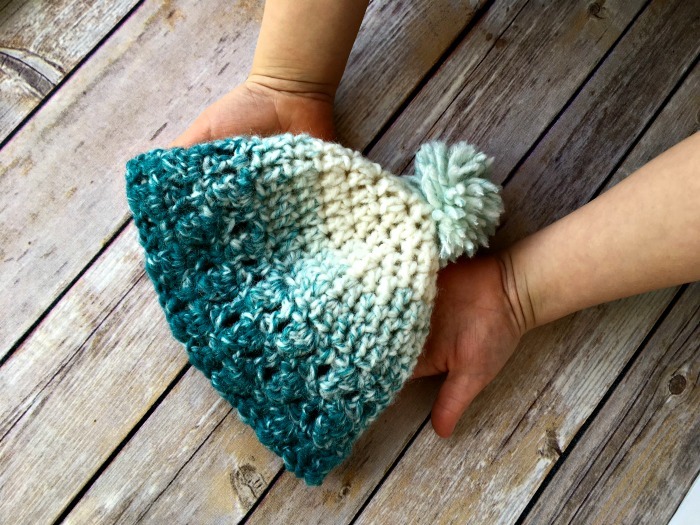 This is a super quick project that you can whip up in less than an hour – and that includes the time it makes to create the pom-pom! My oldest son has recently learned how to use my pom-pom maker and comes running whenever I tell him it’s time to make one. He easily created the one for this beanie as well as for Beth’s Hat and a couple of others that I haven’t had time to get posted yet. If you don’t have a pom-pom maker, you need one! I used to use cardboard for mine and this is so much easier. Be sure to check out the Scarfie Baby Booties that match this pattern! Notes: Join each round with a slip st unless otherwise noted. Ch 3 at beginning of round counts as dc. Ch 4 at beginning of round counts as dc, ch1. Only turn if instructed to do so. 3-dc cluster: Yo, insert hook into st, yo, draw up loop, yo, draw through first 2 loops, yo, insert hook in same st, yo, draw up loop (4 loops on hook), yo, draw through first 2 loops only (3 loops on hook), yo, insert hook in same st, yo, draw up loop (5 loops on hook), yo, draw through first 2 loops only, yo, draw through remaining 4 loops on hook. Round 1: 7 dc in 4th ch from hook – 8 sts. Round 2: Ch 3, dc in same st, 2 dc in each st around – 16 sts. Round 3: Ch 3, 2 dc in next st, *dc, 2 dc in next st; repeat from * – 24 sts. Round 4: Ch 3, dc in next st, 2 dc in next st, *dc 2, 2 dc in next st; repeat from * – 32 sts. Round 5: Ch 3, dc in next 2 sts, 2 dc in next st, *dc 3, 2 dc in next st; repeat from * – 40 sts. Round 6: Ch 3, dc in next 3 sts, 2 dc in next st, *dc 4, 2 dc in next st; repeat from * – 48 sts. Round 7: Ch 1, sc in same st, ch 1, *skip next st, sc in next st, ch 1; repeat to end; turn. Round 8: Slip st to next ch-1 sp, ch 4, *3-dc cluster in next ch-1 space, ch 1, dc in next ch-1 space, ch 1; repeat from * to last ch-1 space, 3-dc cluster in last ch-1 space, ch 1; turn. Round 9: Ch 1, sc in first ch-1 space, ch 1, *sc in next ch-1 space, ch 1; repeat from *. Round 10: Slip stitch to next ch-1 space, repeat round 8. Create pom-pom and attach to top. Weave in ends. That’s it! I hope you’ve enjoyed this pattern for the 1 Hour Baby Scarfie Hat. Be sure to check out my other free crochet hat patterns! So cute! Love the colorway you picked. Pinned! It has been very hard to find a crochet pattern for a baby hat. Tis should be fine. Easy to do anyway. I’ll give you y email address so I an send along my interest in more of your patterns. Why do you turn on some of the rows. I didn’t understand some of the information. You only turn on some of the rows because of the stitch pattern for that particular part of the hat. The part worked in dc does not need to be turned at the end of the row. Hi Monica! I create pom-poms using a pom-pom maker I picked up at my local Joann – it makes them super easy! Love the pattern! About what age baby would this fit? I need to make a hat for 6 month old granddaughter. This pattern is a 16″ circumference which should be good for a baby in the 6-12 month range. Hi Paula! I’m going to change this to 7 dc in 4th ch from hook. That should make it work 🙂 I’ve had quite a few people make this hat and no one ever asked that before but it makes perfect sense! Thanks!